How African Americans are lazy, aimless, shiftless. How there’s a double standard when it comes to using the N-word. 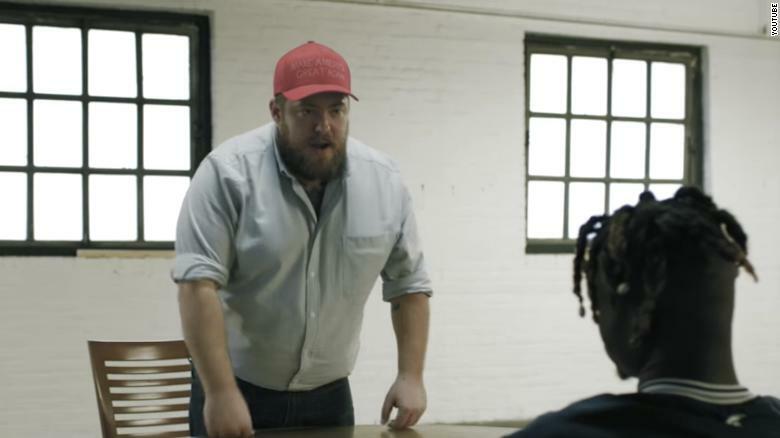 The scene is from rapper Joyner Lucas’ music video for “I’m Not Racist,” and there’s no doubt, it’s uncomfortable viewing. Profanities prevail; misconceptions fly. But get to the second verse, and the song takes a surprising turn — when a young man in dreadlocks gets his chance to respond, to rebut the generalizations, to recount being stopped by the police and rebuffed for jobs. There’s a reason “I’m Not Racist” is racking up millions of views online. It’s driving a conversation about the state of race relations in America. A really, really, really raw conversation, and just how far apart blacks and whites are in how they see things in this country right now. You can view the video here, but be warned. It is peppered with racial stereotypes and cuss words. Lucas is a 29-year-old rapper from Massachusetts, and he says the video really is the race talk that people shy away from. “It’s a very uncomfortable conversation to have,” he told CNN. He explained that what makes the video so shocking is that it’s not a white supremacist or a neo-Nazi saying these words, but a regular Joe. The video is a powerful concept powerfully executed. The two men, both of them lip syncing to Lucas’ words, sit across from each other at a table. First, the white man unloads his frustrations and his views on Black Lives Matter, the NFL anthem protests. There are even potshots taken against 2Pac and Eminem. Then the black man reacts. He takes on white privilege, cultural appropriation, and attacks against former President Barack Obama. The video for the song was filmed last week in New Hampshire, and Lucas said while he knew it would do well, he was shocked so many people had watched it so quickly. And he said most of the reaction to the controversial video has been positive. Reactions like that is why Lucas does what he does. “That’s just my way of changing the world one day at a time,” he said. And in this divided climate, that would be a start.